Following up is a key part of any sales job. It's extremely rare that a rep will connect with their prospect on their first attempt, and so they must try again. And again. But just because this is common sense doesn't mean it's common practice. According to research from InsideSales.com, the median sales outreach persistency rate for inbound leads is a measly one attempt. So much for following up. Maybe sales reps don't follow up as much as they should simply because they don't see the value. But consider that even if a lead isn't a good fit for your product or service, that contact could still provide a referral to someone who is. For this reason, it's critical to follow up with each and every single person you meet at an event. The infographic below from CassiusBlue Consulting lists the do's and don'ts of following up after a networking event. While some tips might be akin to reflex -- for instance, connecting on LinkedIn, and personalizing your message -- others are less obvious. Did you know that adding a contact's email address to your marketing list without permission violates the CAN-SPAM act? And forgetting to set a goal for your outreach (an all too common mistake) can result in a squandered opportunity for a referral or meeting. If you only take one thing away from this graphic, make it this: Following up is central to sales. Just 2% of all sales are made on the first attempt. If you don't persist, you're bound to leave money on the table. Big U.S. insurers are courting one another for possible multibillion-dollar deals. How they pair off could have significant implications for the managed-care industry, its individual and corporate customers, and U.S. medical providers. Each potential target has strengths in different parts of the managed-care puzzle. For Humana Inc., its fast-growing business covering Medicare beneficiaries could be attractive to several suitors. Aetna Inc. has forged relationships with health systems that use its information-technology services, which could benefit rivals. And, Cigna Corp. brings international customers and close ties with employers big and small. These companies, along with UnitedHealth Group Inc. and Anthem Inc., have been talking to each other about possible deals, with UnitedHealth approaching Aetna, Anthem talking with Cigna, and Humana exploring a sale, The Wall Street Journal has reported. Analysts expect tie-ups to reduce the field of five big publicly traded insurers to just three players. The final roster’s strengths and geographic sweep could look very different, depending on how the courtships end—and assuming regulators allow any deals the companies manage to strike. A big deal to acquire Humana could forge a powerful new Medicare player, but some would-be buyers would face antitrust challenges—particularly UnitedHealth, which is already the nation’s biggest player in privately managed Medicare, known as Medicare Advantage. A behemoth among corporate customers would emerge if Anthem locks arms with Cigna. Or, a merger between United and Aetna could create a company with massive market share in many states that might be able to extract deep discounts from medical providers. A deal for “any one of them is a seismic event in the industry” that could put outsize market power in the hands of one company, said John Gorman, an adviser to managed-care companies, including some of those now in the mix. But, he said, some of the possible tie-ups make more sense than others. The moves come as insurers’ core business—covering workers on behalf of big companies—flatlines while new opportunities driven by the Affordable Care Act and other changes emerge. “Employer markets have been flat and they’re declining in terms of the dollars that go in,” said Dan Mendelson, chief executive of the consultancy Avalere Health. “In that world, if you want to grow, you have to go into the high-growth markets,” which include Medicare and other government business, he said. 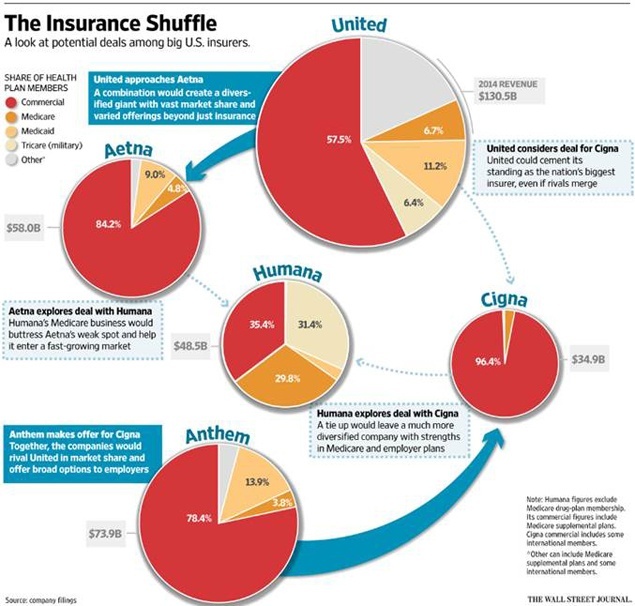 That is what Humana offers its suitors: The insurer, which has shopped itself to rivals, is the No. 2 player in Medicare Advantage. Enrollment in that program is swelling as aging baby boomers opt for managed care over the traditional program. About one-third of Medicare’s 50 million beneficiaries are now in such private plans—about three million of them with Louisville, Ky.-based Humana. Any deal for Cigna or Aetna, meanwhile, would forge a major competitor in the employer-plan business that could gain economies of scale and bulk up market share. Such deals would “help [the companies] on straight discounts and new contracting models,” said Ana Gupte, an analyst for Leerink Partners LLC. Insurers are increasingly experimenting with new ways to pay doctors and hospitals, such as tying reimbursement to the overall quality of care, but such arrangements are only attractive to hospitals when plans cover a large share of patients. Ms. Gupte said Cigna also offers experience in managing plans for employers that self-insure. Some plans anticipate they can nab a larger share of employers that opt for that model instead of paying premiums to insurers, in order to lower costs and avoid health-law changes. For employers, any wave of mergers could potentially result in higher premiums or fees, at least in the short term, several experts said. Many companies put contracts out for bid by health insurers every few years. “If there are fewer players, there are fewer options to look at,” said Steve Wojcik, vice president of public policy for the National Business Group on Health. That could result in employers getting bids from insurers that feature higher prices and “fewer bells and whistles,” he said. Long-term though, analysts and experts expect customers to realize some of the savings insurers might gain from increasing market share or improving efficiency. Hospitals and medical providers have rapidly consolidated in recent years—sometimes leading to higher prices—and employers may benefit from a similar wave in the insurance industry if the heftier health plans can tamp down those prices. That kind of scale, however, might not help smaller customers, especially individuals who buy coverage on their own. “Usually, fewer competitors means prices will be less advantageous for consumers,” said Gary Claxton, an insurance expert at the Kaiser Family Foundation. “It probably means they’re going to be in a better position to maintain their margins,” he said. The aims of the Affordable Care Act (ACA) were to increase health insurance coverage for those under age 65, improve the performance of the health care delivery system, and slow cost growth. Less recognized are the provisions of the law that seek to strengthen the Medicare program. The ACA addresses gaps in Medicare preventive and prescription drug benefits. It initiates ambitious testing of new payment methods to improve the value of care received by beneficiaries and, indirectly, all Americans. And it substantially extends the solvency of the Medicare Health Insurance Trust Fund by slowing the growth of future Medicare outlays. By moving Medicare away from fee-for-service payment and by holding health care providers accountable for both the quality and total cost of care, certain ACA reforms have the potential to reshape not just the Medicare program but the entire U.S. health care system. For example, the law’s creation of the Center for Medicare and Medicaid Innovation (CMMI) will enable Medicare to test innovative models of provider payment and service delivery and expand those that demonstrate promise to improve beneficiary outcomes and patient experiences of care or lower cost. The projects initiated by the CMMI are just now beginning to produce results; significant work remains to identify and spread successful payment innovations. The ACA also makes important changes to the Medicare Advantage (MA) program, through which enrollees can choose to receive their Medicare benefits from private plans. Payment rates to MA plans are to be constrained until those plans are on a par with traditional Medicare, though financial rewards are available for plans achieving high performance ratings. These changes are intended to provide incentives for MA plans to improve quality and patients’ health care experiences and encourage beneficiaries to choose plans with higher quality and lower cost. While these new policies strengthen Medicare, they were not intended to address some of the serious challenges facing Medicare in the future. Without additional changes, the retirement of the post–World War II generation will cause total Medicare outlays to outpace growth in the economy, claim an increasing share of the federal budget, and exceed the revenues currently dedicated to the Medicare program. As currently configured, Medicare benefits do not adequately address the financial and health care needs of future beneficiaries—particularly the poorest and sickest among them. Traditional Medicare’s benefit design reflects the fragmented nature of health care delivery, with separate hospital, physician, and prescription drug benefits adding to the complexity, administrative cost, and difficulty of coordinating care. The predominantly fee-for-service provider payment system used by traditional Medicare, and by most MA plans, provides no incentive to eliminate duplicative or ineffective care, coordinate care, or substitute lower-cost care alternatives—and in effect penalizes providers who do so. This mismatch between benefits and needs will be an increasing source of concern as families struggle with out-of-pocket costs, serious health conditions, and inadequate options for caring for family members with physical and cognitive functional impairments. While the ACA’s reforms hold significant potential to make Medicare more viable and successful in the future, Medicare’s long-term fiscal solvency, complexity, and gaps in coverage remain unaddressed. As millions of Americans age into Medicare, federal budgetary pressures will inevitably focus attention on more fundamental reform of the program. Not in the Medicare Advantage market but are interested in learning more? Request details or visit our list of companies.